the truck after my crash. My shoulder is sore but not broken I think. escape this day without great harm to myself. The first fear I would face was that of being in small dark places. collapsing in on us. I, of course, did not go first. think of I made the crazy statement, "Well, I'll go first". dirt and spider webs on my shins and hands, a thought crossed my mind. like a snake. Did someone say snake? repeated myself with great conviction in my voice "I am not joking. both seized the moment and out the tunnel we went. “Look! a cloud!” Josh yelled. We all looked in amazement at a tiny lonely puff high up in the cobalt blue of the late afternoon sky today. Ever since entering the Northern Territory we have had blinding starry nights so clear and vast, and days extremely dry and sunny with cold mornings…COLD? Yep, since we are so far inland, our new climate is not affected at all by the ocean, or any large water mass for that matter. When the sun is up, it’s hot, and when the sun is down, it gets really cold! The temperatures are very extreme when there is no moisture in the air. This morning was our first on the Northern Territory time zone, which is a half hour behind Queensland's. When we left camp, the sun was already starting to heat the air up, which was a bit of a relief. We took our time through some beautiful rolling hills and had only gone 15 kilometres by 10:00 am. In speaking with a local cattlewoman and property owner today, we found out that this was an exceptional year in terms of rainfall. Normally the average is 11 inches, but this year they got 35 inches! We told her that we had noticed the cattle were looking very healthy. Also, what might seem a barren landscape to some was a thick and grassy paddock to her. Also, because of this factor, she warned us about where we made fires (that is one thing our group has been very good at the whole trip so far). By 51 kilometres we decided to make camp and call it a day. Our new member Git had pulled off her second day with no complaints and an exuberant attitude the whole time! We are now in another dry creek bed with low-lying rocky hills around us. 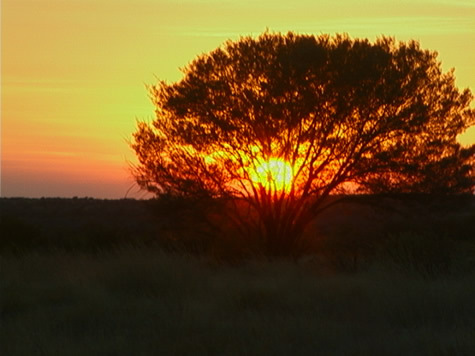 Soon, when the sun goes down, the flies, who thrive in the dry climate, will have gone ‘to bed’. As a group we have come to appreciate the dryness and be more aware of what we consume and waste. I myself love this climate and I am very aware of it because of the bloody noses it gives me. Do you notice the climate around you? –Charles Sturt, Narrative of an Expedition into Central Australia, 1849. I wish you were all here to see the colours of this sky as the sun is falling. Blue and lavender bands of all hues, layering one another. It echoes my day today, the first of my days with the expedition. My mind raced while riding, through nervousness, anticipation, fear, exhilaration, doubt, confusion, boredom, exhaustion, happiness. I had expected to go through each of these states slowly over the next six weeks, but now one lasted only minutes before giving way to the next. And all the while there was this strange, dusty red road before me, providing some continuity. As I mentioned in my update yesterday, I became involved with the expedition through John, with whom I was travelling by bus. Three days ago, early in the afternoon, he asked if anyone wanted to join in the trip, and by dinnertime I had, in my mind, already committed to it. It will throw quite a wrench into the rest of my life: I’m supposed to be in Columbus, Ohio, continuing my third year in medical school. I’d been allowed a six-week leave of absence by the dean of my school, and used it to come to Australia, to have some time and space to think about the choices I’d made thus far. I’d made some headway, but knew I needed to have my safe life challenged, to take away all my supports, if I were to come to any unclouded conclusions about how I wanted to spend my life. Well, the supports are gone; this trip is certainly devoid of any comforts of home! But I have food (of a sort) to eat, a spot in front of the fire to spread my sleeping bag, a group of people whose company I enjoy (even if I occasionally question their sanity), and a bike to ride and ride, trying not to prove anything to anyone, including myself. The trip today began on the corrugated, straight path that the group has followed the last few days. The monotony of it meant I had little distraction from my saddle-soreness, which began not an hour after setting off. Somewhere around lunchtime we met with John in the truck, and I finally had a chance to call my poor parents and inform them of what I’m doing. “Um, hi Mom and Dad. I just wanted to tell you that I’ve met a man on a bus and I’m not going back to school this year and I’m gonna ride a bike across Australia so I’m not coming home and everything is totally kosher and probably really safe and I’m fine and…. You guys? You still there?” I’m sure they could hear the rest of the group cackling in the background, which no doubt made them feel ever so much better. If they could have been here to see what came next, they’d understand why I’m on this trip. The Phone Call placed, we got back on the bikes. After having followed this straight, static highway we’d been on for hours, we turned south onto a side road. Everything changed. The road curved, rose and fell. The yellow and faded green brush gave way to more vibrant shades, and a new flower with a colour between pewter and sky-blue cropped up. The flat land grew to hills and the occasional splintered peak. And when we rounded one hill and edged over its crest, we saw…well, why don’t I shut up already and let the others tell you themselves! Their comments can be found in the education/literacy update. Well, I’m finally back in camp with Blue Dog, who is so excited his ears are wrapped up around the top of his head. The last two weeks have been very busy for me since leaving the expedition at Georgetown. I returned to Cairns because the president of the Cairns Art Society was expected at our annual exhibition opening. The following week I performed an acoustic art show in Brisbane, returning last Sunday. On Monday, I found it very difficult to return to Mt. Isa, due to the reluctance of rental car companies to send their vehicles there, etc. 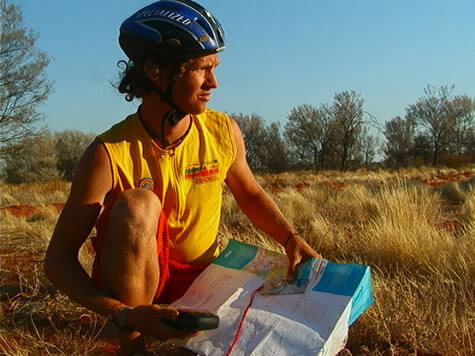 On Tuesday, I contacted a tour company who runs from Cairns to Alice Springs, and found that they followed the same outback adventure trail that the expedition are on, but they informed me that they leave on Tuesdays and Saturdays. After contacting the manager of Down Under Tours, they kindly offered a sponsorship for my fare to return to the expedition. I set out on Saturday, and after overnighting in Hughenden, I thought that in the group of backpackers on board, there may be a person interested in joining the expedition, so I announced this on Sunday. A young lady expressed her interest, and later in the day Margit (also known as Git, pronounced Geet) told me that she would join the expedition if it was at all possible with the plans of the group. I called Jason Monday at lunchtime, and we met the expedition 25 kilometres west of Jervois Station. I must admit, I did have a lump in my throat at the reunion with my found and lost friends. 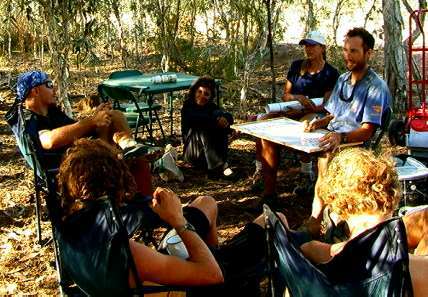 After the excitement died down, Git being accepted to the expedition, transferring the freight, and bidding farewell to our accommodation coach driver Greg, we continued to our next campsite, forty kilometres west of Jervois Station. I was reminded vividly of my previous life on the station, and stunned but not surprised at the change in everybody’s bush-induced relaxed character. For example - Jason swilling a cup of black tea and yarning without a thought of schedules, just like a boundary rider who sees someone for the first time in three weeks. It is good to be back. 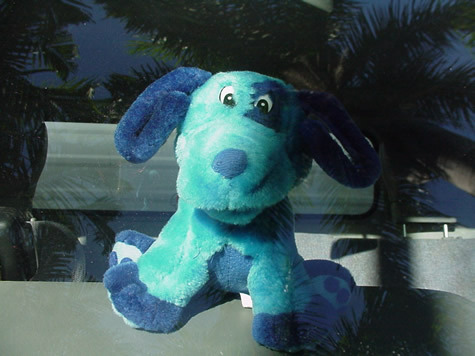 Blue Dog’s not good in the city. Hi there! This is Git, the lucky chick who’s managed to get herself mixed up with your esteemed band of expeditioners. I woke up yesterday morning ready to face another day of the same old same old, i.e., an eight-hour trip across the red sands in a cushy coach with video and air-conditioning. Hah! Not six hours later my life was upended by your friend and mine, John. When he asked if anyone had an interest in joining the expedition, my initial reaction was ‘of course!!’. I expected my rational, sensible, responsible self to chime in and convince me of my foolhardiness, and calmly suggest that I return my thoughts to what awaited me at home in the States: school, bills, and probably a dirty dish or two. Well, friends, I’m still waiting to hear from that sensible side, sitting here in front of a campfire, full of johnnycakes and billy tea and a warm feeling in this cold desert night. I’m so looking forward to writing to you all in the coming weeks! Well, more communication disasters again today between the support truck and the cyclists. Unfortunately, these came at the end of the day when the bikers are tired and hungry, while the support crew want to be released from their tiny little cab and allowed to frolic among the spinifex at will. Kilometre 81.5~ The cyclists ask what kilometre reading the truck is at and are told that the truck is around Km 83, but that might not be exact. A little flag will be left back out on the road to mark the road the truck turned off on. Kilometre 88~ The cyclists are irritated that they haven’t found the flag yet and try to hail the truck on the radio. Km 90~ The cyclists finally get a hold of the truck and compare GPS positions. They’ve obviously gone too far. So they head back toward Km 83. On the way, they get two flats. It’s getting later and later. Lots of grumbling. Km 83~ The cyclists discover that this position is incorrect. How much further do we have to go!!! Km 80~ The cyclists meet the support crew on the road next to a flag mounted in a very obvious location. Well, reading this you can easily see what happened, but the blaming fingers were unsheathed. Who was at fault? Heads will roll! Was it the support truck’s duty to radio the bikers before they stepped off the road into the bush? Or was it the cyclists’ duty to call as soon as they had travelled the 15 km to Km 80? A heated meeting followed with some thinly veiled finger pointing. Voices were raised. Some were left bristling. The usual shtick for us. It could have been scripted. However, give us some time and we’ll all realize that nobody was at fault in particular and that we should simply try to communicate better via radio in the future. I think this is at least the third time this has happened. It will not be the last. Isn’t “lack of communication” always the basis of one’s interpersonal problems? Still, we had some fun today. The support truck stopped right next to, by far, the largest termite mound we’ve ever encountered--a glorious 6-metre bulbous mound of pock-marked orange. We had a good half-hour of playtime there with Crister and Bel inching their way to the top and the rest of us swirling underneath taking snapshots and video. The foot and handholds were a bit tenuous and there was a little fear about getting down off the thing safely, but still Crister and Bel boldly went and then managed to get back down safely. Please see our educational updates in Science, Environment and Maths for some interesting info on termite mounds and their little occupants. Although we have encountered thousands of termite mounds, there is not an ant to be seen in the sands surrounding them. The termites whose mounds we played upon today leave their underground labyrinths only for their rare mating flights, when hundreds of the “royals” take to the skies after rain, before beginning to build new mounds. 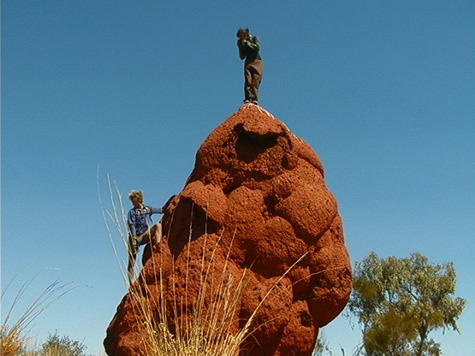 Each mound and its related tunnels can contain millions of termites, and the total weight of all these invisible underground dwellers exceeds the biomass of all creatures living above ground in the same area. 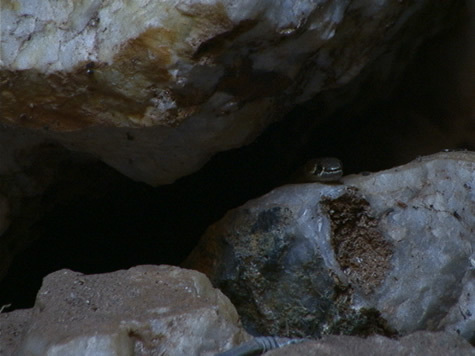 Tunnels are used to bring water to the mounds, to raise humidity levels. Plant resins, especially from spinifex, are used to reinforce the walls of paths reaching for one hundred metres under the earth - an amazing capability for creatures less than half a centimetre tall. Ants are one of the largest families in the animal kingdom. 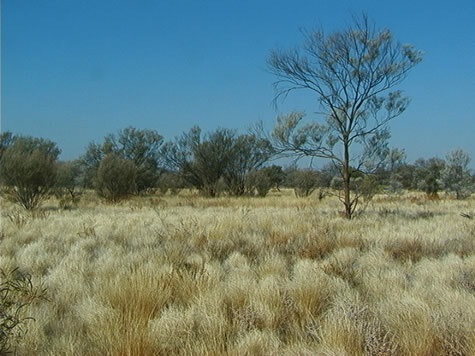 Fifty or more species are known to coexist in a small area in the Australian Outback. New species are constantly being identified, and it is expected that they will continue to be. Listen to the sounds around you. Take a moment to mentally list what you hear. Do you notice a car on the street? A siren in the distance? An airplane overhead? Our daily sounds probably vary a great deal from our ‘normal’ lives. Along the Plenty Highway, we are camped near a gravel road leading to a small cattle station. The sounds we hear are of the wind whistling through the mulga acacias, the soft tapping of our fingers on the keyboard, two birds calling in a distant tree, and that’s about it. It was coming toward the end of the day and at first we hesitated, anxious to get to camp another fifteen kilometres down the dusty road. But, what is another ten minutes out of our way when we’re going to Darwin? We all dismounted, laying our bikes on the side of the road and separately journeyed into the secret garden. There definitely was an aura surrounding this uniquely indefinable spot. One of the most incredible things we noticed was the sound of silence. It was deafening! You couldn’t hear any sounds at all! No jets overhead, no cars racing by, and none of the calls of the noisy parrots that have been following us for most of our journey. How curious that we had discovered this out-of-the ordinary environment in the midst of our biking routine…We left the place, the gravel crunching under our tires, glad that we stopped and noticed the silence. The very idea of joining up with the expedition was, for me, a frightful challenge. I had visions of deathly poisonous snakes, spiders, angry wild pigs, cattle, water buffalo, cassowaries, and salt water crocs being the things that would team up in order to keep me from completing the stretch from Cairns to Darwin. Though I have seen many of those things, none of them have been quite as ‘dangerous’ as I have been to myself as late. But before I tell you of my latest ‘road block’ I have set for myself, lets first bring you up to date. First, day four, I managed to tare my bike spindle, which allows my cranks to work. I end up walking 20 kilometres that day. Second, day six, I give into heat exhaustion on the Maytown track trail and spend a day in the truck to recoup. Third, day twenty-one, while having a great time trying to beat a 19-year-old track star in bike sprints, I managed to strain my knee. Not knowing at the time how serious the knee was I again contemplated having to go home. Luckily we had 3 full days of rest in Mount Isa, and on the third day it looked as if I would continue. The knee felt good enough to ride as long as I took it easy. Well one would have figured that at that point I had been pre-disastered, right? Number 4, day thirty; we are leaving Mount Isa. It is a great day. My knee feels solid and I start to get comfortable in the seat again. 80ks into the ride and back on dirt I meet Jason and his bike coming up behind me being chased by Josh. We were all playing a little game of steal from some ones backpack and try not to get it taken back. Well I had Jason’s hat and Jason had Joshes hat, thus the incident was about to occur. I was quite a ways ahead of Jason and Josh going along at about 20ks when Josh started chasing Jason at about 30ks. Jason figured he would take a swipe at his hat as he went flying by me. As I looked back, Bam!!!!! The next thing I know I am on the ground in quite a bit of pain. I have two smashed pieces of fruit in my pocket; a good size road rash wound up my elbow, a cracked helmet, bit of a headache and a very soar shoulder. After the group did a great job getting me cleaned up I stated I wanted to finish out the day. We road a total of 110 Ks and I knew at the end of it this was maybe my last ride. The nights sleep was non-existent and the pain in my shoulder became worse. We all decided April should take me 150ks back to Mount Isa for x-rays. As April and I rode off this morning it was hard for me not to cry. If my clavicle was broken I would be heading home never accomplishing what I had set out to do in Australia. But mostly I was sad that I would not get to say good bye to my new friends. I would miss being with them. After several hours at the Mount Isa’s hospital watching two doctors argue on whether or not it was broken, the end result was that I should rest it for as long as I feel necessary and get on it as soon as it feels comfortable. They wrote a note for the Alice Springs hospital so I can get a x-ray there. In 8 days the swelling would have gone down and we should be able to tell then if it is broken. This was good news. I would be able to get back with the group and hopefully get back on the bike in a couple days. When we met up with the group later that evening the tears were back and I was greeted in a very warm fashion. It’s good to be back with the group. The question remains; am I out to get myself or will I make it to Darwin. As April and I rode out of Queensland and into our new terrain - that of the great Northern Territory - we decided to get out and take a photo. As I jumped out of the truck I managed to land on a thick bush that had a stem sticking in my big toe. I showed it to April and we both laughed as I yelled ‘you must do better than that!’ So only time can tell if I make it to Darwin, but with the group I have around me it sure beats going to work every day. 2001 August 2, Wednesday. North Urandangi Road. clean running water; and there's no such thing within Mount Isa. and water bottles, I was searching desperately for an alternate source. clean, with washed hair and clothes, just in time for the meeting. then moving on once we've found it. Always restless. terrain around Arltunga, reminiscent of the Maytown track (we hope!). My tasty experience happened today when myself and four other members of the expedition took a bush tour in and around Mt. Isa with our indigenous guide, David. On the tour we learned about the history of the people of the area, old and new. 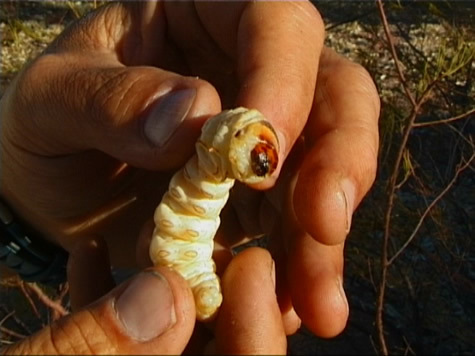 Also we learned a heap about bush tucker, or food! From witchety grubs to the banana vine, we were sure better off in terms of knowledge when we were done. The tour started at about 1:30 and all five of us took his Land-Cruiser and our Mitsubishi out of the town of Mt. Isa into the bush. Along the way to our first rock-painting site we learned about the banana vine that bears a fruit that tastes like fresh green peas, and how the wax of the spinifex is used by the local ant population to make tunnels. It can also be used to heal wounds and even fix a leaky water bottle! During the whole tour we were enlightened by David’s simple but vital knowledge of the bush. The rock art we got to see also was lit alive by David’s insight into the different shapes and designs! It was neat to see what we had been riding through for the past month suddenly come alive and speak to us! As I sit here on Greg and Margaret’s front lawn, I reflect on my knowledge packed mind. On tomorrow’s ride we’ll see deeper (and tastier) into the bush! “This has to be one of the best bush tucker tours you’ll ever take,” Rebecca explained. So, on her recommendation, we opted out of leaving Mt. Isa today and booked a bush tour to learn about the various Aboriginal clans in the area, their customs and ways of surviving in the bush. 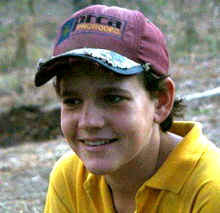 This was especially interesting for me as I had created several social studies lessons last spring around bush tucker. Today, the research that I had done suddenly came alive. While cycling from Julia Creek last Thursday, we met three other cyclists: a boy from Japan, who is taking an eight month tour of the country by bicycle, with no vehicle support; and two road bikers, Greg and Jim, who live in Mount Isa. Greg invited us to stay on his property along with 4 large dogs that like to lick everyone and everything. He and his partner Margaret run a gym in town called Body Balance. They also have two camels, two goats and a number of chooks that came with the house. We have stayed in Isa longer than we expected to, as all the things we cannot do in the bush, including the post office and banks, took longer than expected. We also pulled everything out of the truck – hard to believe how much we’d been dragging around with us that we don’t need – and re-organised and cleaned it. A good rest, shower, and laundry day was also past due, and we used the comfort of Greg and Margaret’s house to wind down and get cleaned up. 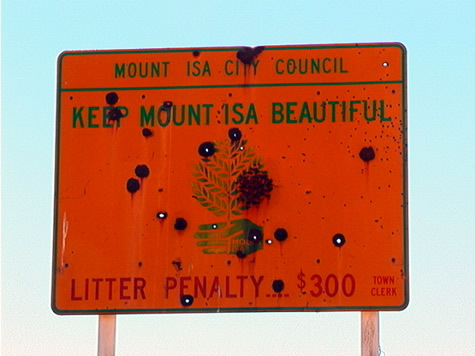 Mount Isa is an absolute raging town at night. Bel and I were pressured by Todd and Rebecca to go to the Irish Club where they were meeting Greg, Margaret, and their friends for dinner and drinks. The club was playing country and western music, Todd and Rebecca had not been seen. Shortly after entering, we left. We began a search of the town (on bicycles) and found ourselves outside the nightclub ‘Switches’. While standing at the door, debating who should have to go in there, an older man (with a three year-old girl in his arms), emerged from the club, and asked why we were there. I told him we were looking for two Americans, and asked if he had seen them go in. “There ain’t anybody in ‘ere”, he said. We thanked him and left. Deciding that we should try the Buffalo Club, as it sounded like a good rough place, and Todd and Rebecca were after some real Mount Isa Culture, we were greeted at the entrance by an old, old lady who asked for i.d. I presented her with my government issued 18+ proof of age card, but she only wanted proof of where I’d come from, which I didn’t have. Bel was saying: “look at those neon lights and middle aged people who should be home with their children! this place isn’t rough! this is a pokies palace! Todd and Rebecca would not be here, and we don’t want to be here.” We left. Eventually, close on midnight, we saw the truck, and found Todd and Rebecca had been at a Chinese restaurant. We exchanged stories and chatted with them for a while, then planned to meet them back where we were staying. After minor incidents with four police cars, and a road block in our honour, we left the city, and met the others back at camp. Hey everyone, its Rebecca, from Minneapolis - the photo / video exchange coordinator. Now that I’ve hi-jacked the expedition and locked them all in the truck, I have complete control over all updates. JUST KIDDING, I just popped in to say hi after completing my work with Yirara College in Alice Springs. For the past three weeks, the students at Yirara have been using cameras during their after-school activities to record their world. 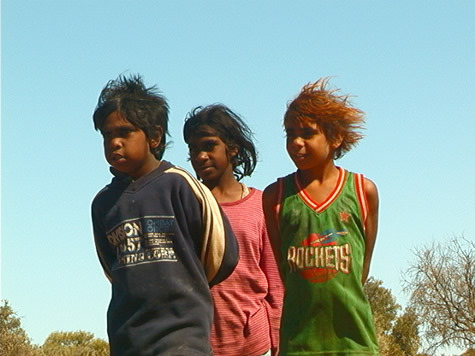 Yirara is a boarding school for Aboriginal kids from tribes across the Northern Territory. They have captured such events as roasting kangaroo tails; using swags for camping; and life in the dorms. Stay tuned to the photo / video program web page later this year for their work. 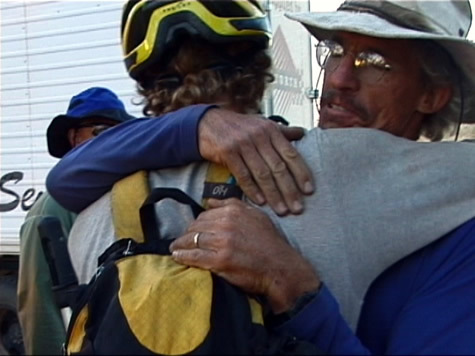 I arrived in Mt.Isa on Wednesday to meet up with the bike team before I headed back to America. Since they didn’t arrive until late Friday afternoon, I needed to keep myself occupied. I started on Thursday with a bush-walking tour of the Kalkadoon aboriginal tribe’s rock-art sites. I learned about the foods they eat (bush-tucker) and medicinal and artistic uses for plants. On Friday I checked out the iron, copper and lead mine, and the underground museum, which simulates the underground mines. Then met up with everyone for pizza. Saturday while the team ran their errands, I discovered the fossil museum and lab. 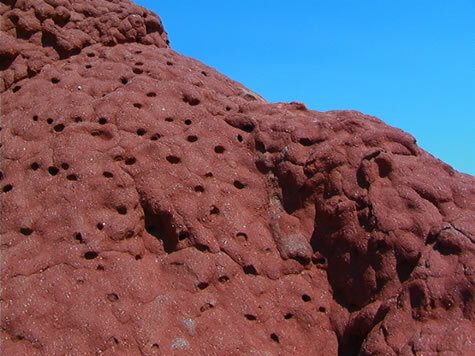 The fossils come from Riversleigh, a large nearby deposit of fossils dated between 25 million to 1 thousand years old. In the lab you see the process of using acid to dissolve the limestone and recover the fossils. 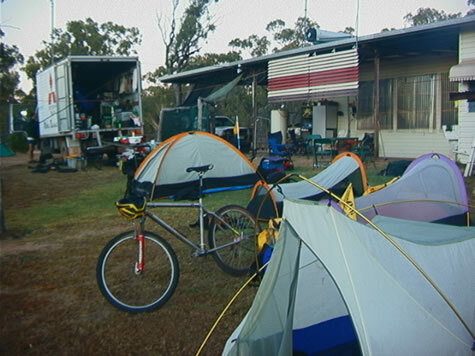 I met up with the team later on Saturday at their latest campsite- the home of Marge and Greg just outside of town. Today I’m hanging out with the camels and dogs on the property taking photos, while the crew is organizing the truck and having meetings. This afternoon we’re having a barbeque before I say goodbye and hop on a greyhound bus to Cairns. 2001 August 16, 2001. Thursday. Thirty-five kilometres West of Cloncurry on the Road to Mount Isa. Riding along a major thoroughfare again, missing our quiet, unsealed roads; we can’t help but appreciate the smooth surface and easy grades of the highway. Although we’d all prefer a blazed dirt track with a bit of character, it’s easy to see why people need the roads. The security of having even the rough tracks is taken for granted. Upon moving out of sight of the road, the surrounding country all looks alike and finding one’s way is all but impossible without a compass, stars, or the sun low on the horizon to give a clue to East and West. 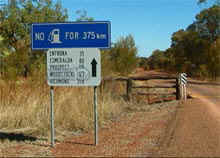 The road between Cloncurry and Mount Isa crosses the route which Robert O’Hara Burke, William John Wills, and their small expeditionary team took in 1860. As the first to travel overland from Melbourne north to the Gulf of Carpentaria, they would have encountered precious little evidence of European civilisation. Any hospitality offered by indigenous people would have been foreign and uncertain, as people of the time knew little of the culture of the aborigines, and rumours of cannibalism and hostility were common. 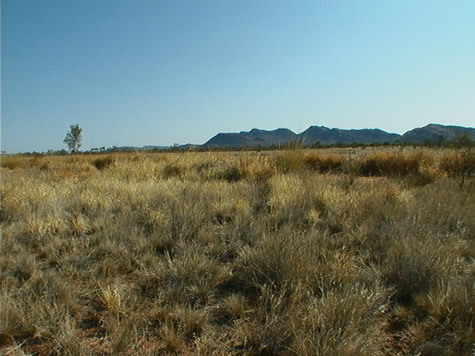 After struggling over the mountainous southern part of the country, they would be greeted by coarse spinifex and hummock grassland, searing heat, and the vast isolation of the savannah which we are now experiencing with Expedition 360. 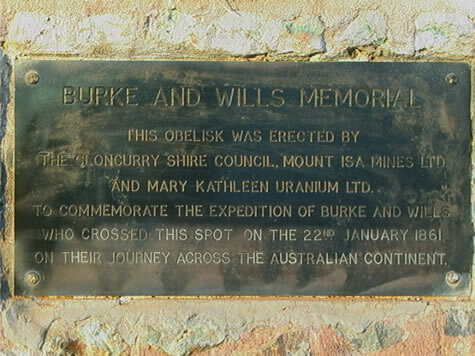 Although the Burke and Wills expedition ended in disaster (dying of starvation on return to base-camp – abandoned by their support team that same day), what they accomplished was an astonishing achievement, perhaps unequalled in the history of this continent. Both locals and tourers met along our way have told us that what we are attempting is anything from crazy to excruciating. However, it’s all relative, and with the achievements of pioneers such as Burke and Wills in mind, our one hundred and twenty-six kilometre day (complete with UHF radio communication. and a support truck waiting for us up ahead with scroggin and water) is somewhat humbled. Punctures have again plagued us along the highway, after having had a respite from them while on the less travelled roads. Thorny plants seem to benefit from the road trains full of cattle to spread their seeds, and thrive along major roads and in towns. We are again following a road train route, and have seen some absolute beasts. 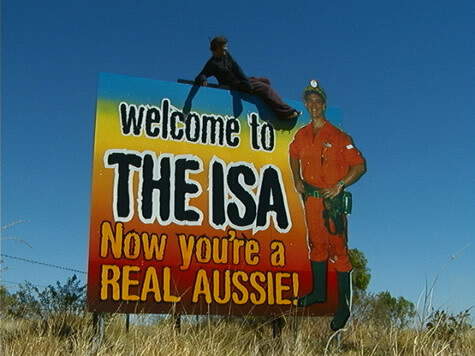 Mount Isa and Cloncurry are both mining centres with ores are being trucked out, while fuel and supplies are brought in. 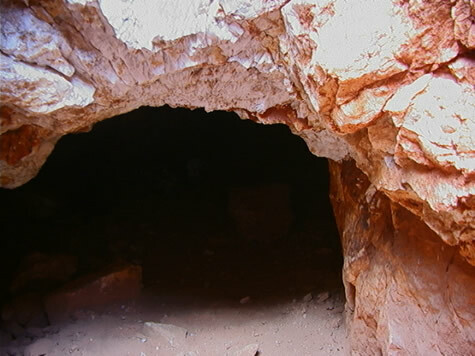 The area is rich in a number of valuable minerals, and in Cloncurry, uranium mining is active quite close to the town centre. While some of the trains are a bit scary, we have had no incidents as close as the one on the developmental highway, and we have seen some very friendly and courteous drivers who have been quite willing allow us our share of the road, and some leeway besides. Tomorrow we can expect to reach Isa by midday, where we have running about and stocking up to do which will probably amount to a day off. 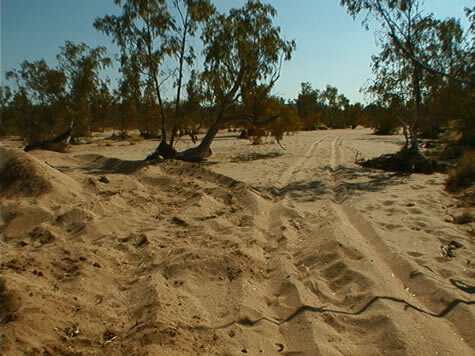 Not too far beyond there, we should have our dirt back, along with corrugations, curious cattle, dirty faces, isolation, and our ‘tans’ of dust. Joy! Day 23: Wednesday the 15th of August. Today, from the very start of our day at 4:30 am, the expedition group was to key on the major importance of community, and how each individual plays a valuable role in the stability of a community. It was to be a common theme for all of us throughout the day, because one of our members was leaving this morning. We did not decide this as a group in the morning by proxy, but at the end of the day we came together to find all of our observations revolved around communities. As we discussed these observations, along with an agreed feeling of sadness at losing one of our members, the group came to the conclusion that perhaps the loss of a member, or the gain of a new member, can create a very unstable environment for the whole of the community. These are some of our observations. The small communities in Australia seem to be the most fragile at first glance. Such as the two neighbouring families in Palmerville, who have chosen not to speak to one another for over 30 years - they have completely rejected the community around them. Can a community survive more than 30 years this way? The small families who work hard in stations without much contact outside the station except by radio. How would the family react if the children went away to school? The small towns such as Julia Creek, which are communities born out of necessity to help weary travellers get to where they’re going by supplying fuel, water, and food. What would happen to Julia Creek if the fuel stop owner pulled out of town? Even the free range cattle and sheep have a unique community relationship with the native animals such as the kangaroo and the introduced species of the wild pig. Many tragic examples of the introduction of a new species into an existing community can be found here in Australia, but we have seen first hand how some of these communities are willing to run with one another. Can you imagine wild pigs running willingly with Brahmans through the Australian Outback? The Expo 360 team is a community. In twenty-two days all of its members had found their function in the group, and knew how best to organise a full twenty-four hour period. It had taken a lot of trial and error but we had become synchronous. A great example of this synchronicity is the time it took the group to load the equipment into the truck each morning. We went from five hours to thirty minutes! A well-oiled machine to say the least. To lose just one of us meant a huge dynamic shift in the group. It meant we had to divvy up his lot among the rest of us. We also decided that this was better than wishing for a newcomer to take over his allotted chores. Why? Maybe because Jim was not just a drone, but an individual that added flavour to our community. That flavour can really never be recreated - thus the feeling of loss as a community and the resentment of someone who tries to take his place. We will miss Jim in our little community, and we will brace ourselves with great enthusiasm for what dynamic he has left us in his absence. For those of you who don't know what an Emu Parade is, it's when you have spent enough time somewhere to mess it up with rubbish. 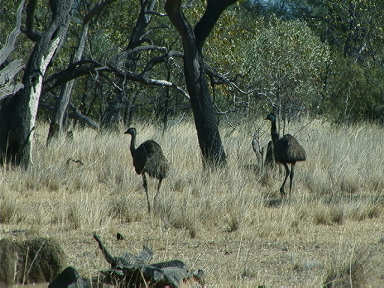 The actual Emu Parade part is when you clean the place up; collecting rubbish, to clear the campsite/area. I woke up at 4.10am - with a large amount of cursing to myself - to have the camp breakfast ready for the rest of the gang; porridge and billy tea. I ate my breaky and slept/zoned out until leaving time. Our campsite wasn't in the best shape and we had to have an Emu Parade before we left. We cycled over sand for 2 and half-hours, half of which was walking. We then met a few men sitting around drinking coffee inspecting the track, looking for the easiest and fastest way on redoing the road. We stopped and talked to Shorty; a tall man who wears small boys' football pants. We also met Shorty no.2, who is just small. They told us about the route we should take, and were most helpful. Around 45 minutes later, our trusty fill-in support driver, April, radioed back to say that there were several emus by the road. We stopped at the support vehicle and looked at the most curious cows we have come across. 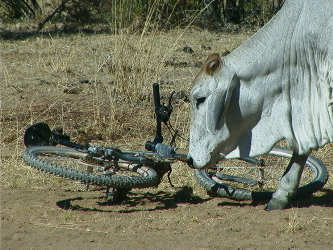 As a matter of fact they started nibbling on Todd's Super V Cannondale bike. We stared in awe and didn't save the bike from being mistaken for aluminum grass. Meanwhile Bel diverted our eyes to two emus parading and inspecting our newly used bicycles. They didn't want to eat the bikes though. This was a rather special time for us as we had two animals we rarely (emus x 2) or commonly (cattle x 15013) see, come up close and inspect us. We realized that it was because we are usually polluting the air with noise: laughing, talking, shifting. So instead of us attempting to find the animals, the animals found us. The rest of our day was rather uneventful except for the fact that I got the only puncture for the day. A long cycle over rather hard ground and a scenery change of dense brush to 5 or 13 trees off on the horizon, some 15km away (but maybe they were small trees though and were only 8km away?). They looked a long way away anyhow. So I am now sitting under the stars writing this and thinking more about going to bed. 4:30am: My dad gets up and puts some logs on the fire. Our "Billy" tea is put on boil. Porridge as well. 5:00am: I'm up with some other early risers and we pack up our stuff before eating. 5:30am: Usually everyone is up by this time, and camp is buzzing with the sounds of closing zippers and the clinking of teacups. 6:15am: Clean up camp, and begin to load the truck. This process has come from 4 hours down to 20 minutes! 6:45am: A gathering of everyone before the ride signifies that we are ready and raring to go! 7:00am: (which is sunrise): We're out'a there! Our clipless pedals clip in and tires get rolling! 8:30am: A ritual-like stretching regimen (5minutes) occurs and will help soreness farther down the track. 10:00am: Our clothing layers peel of as the sweat begins to form on our brows; the day is heating up! 11:30am: 40 or 50 km usually have been done and we all have a tea and biscuits break. Most everyone is already way hungry and ready for a short break. Noon: Riding, riding, and riding with a connection with the vehicle every 10 to 15 kms. 1:00-2:00pm: Very hot! Riding is slowed to a slog, but we keep moving! 3:00pm: We begin looking for a campsite and have put in nearly 8 hours on the trail already. 4:00pm: Unloading of the truck at our found campsite. 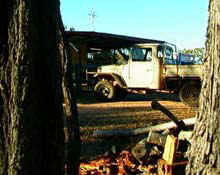 Some members will gather firewood while the unloading is being done. 4:30pm: A quick meeting on our educational updates and the logistics of tomorrow's ride are talked about. 5:00pm: Cleaning bikes, writing updates, reading, bathing (if there is water! ), and cooking. 6:45pm: Eating, or fuelling our tanks as we call it. A general good time around the fire! 7:30pm: Cleaning up dinner and a mellow tone around camp ensues. People writing updates are usually still writing! 8:30pm: Music around the fire is around and a few tall tales and stories are told. 9:00-9:30pm: I write in my journal and slide into my sleeping bag, while some others are just waking up! 10:00pm - 1:00am: Most are deep asleep, but most nights Jason is up on the computers sending information to the web site and fiddling with the satellite phone! And now, our day is done! 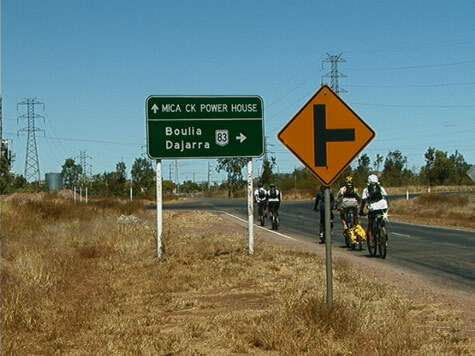 The team members stared at the road sign in the fading sunlight, 'Julia Creek- 375km'. Pictures of a fuel pump and water tank, a line drawn through each, indicated no services available. At sunrise, the team headed south while I struck out for Croydon, 25 km in the opposite direction. I had a list of 'to dos' when I arrived. Jason had given a list of instructions, "Call John in Cairns to see where all of the porridge may be stashed in the truck. If he thinks we've gone through it, you'll have to stock up. Top off the extra water drum, as well. This next 375 km looks pretty dry." As I pulled into town, the stark contrast between Mt. Surprise, Georgetown, and Croydon was evident. Croydon, with a population of 250, had the feel of a town in use. Not much in the way of shops catering to the passing tourist, but businesses suited to support a cattle and mining area. After calling John, I determined the missing porridge might be hard pressed to find in the dark recesses of the truck storage box in a short amount of time. I would pick some up at the Croydon General Store. I discovered it off the beaten path, the truck route, across town. A long, narrow 1930s vintage building awaited me. Gazing up at the floor to ceiling wooden shelves in the dimly lit space. I searched out the items on my resupply list. Unable to locate much of anything I needed, I inquired of the woman standing behind the counter. "Excuse me, but do you have boxes of porridge?" She located the porridge section halfway up the wall. "Oh, good," I remarked. "I'll take two, please!" Peering at me over the top of her glasses, she brusquely remarked, "You just need one box. One box makes a lot of porridge." "Uh, well, I'd really like two, please," I explained patiently. "You see, I'm feeding a crew." Mumbling as she reached for the second box, she remarked, "Well, you only need one…"
"I also need some jam," I began hesitantly. "Do you have some apricot?" The woman ambled over to another shelf where several jars of assorted jam were stashed. Eyeing the selection, a jar of marmalade leaped out at me. "Oh! I'll take the marmalade, too," I said excitedly. "Nope…Don't need it. It's a 'lite' brand," she countered. Exasperation in my voice, "But I WANT it!" I couldn't believe how hard it was to be spending my money in this store. "Nope," she replied once more. "It's not the brand you need. Get a second jar of apricot…"
"Fine," I sighed. "Apricot it is…" Paying for the limited amount of groceries, I thanked the woman for her help. "Hmmmm," she acknowledged as I headed out the door. The shopping completed for the day, water and fuel tanks topped, I left town to track down the rest of the team. After my exasperating shopping spree, the high, wide, and lonesome of the Outback looked pretty darn good once again. What's in a name or a number? What is it in a name which can stir so many memories, dreams, sights, sounds and smells, even of places we've never experienced before? Then again, what magical powers are in numbers, which give them the power to define, to communicate understanding, to share information? Sitting here on the banks of the dry Yappar River in the hot Gulf Savannah region of western Queensland, swatting flies and recovering from our 87 km ride this morning, I've been thinking about words and numbers. And thinking about how to communicate some of the sensations we here on the Australia leg of Expedition 360 are privileged to be experiencing. So here goes. 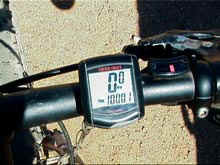 We crossed the 1000 km mark on our cycle odometers today. 19 days into it of hard riding, with a few recovery days, and here we are. What was the 1000th kilometer like? Same as the 999th and the 1001st, hot and dusty, open grass woodlands, thinning forests, and only one vehicle on the track since dawn. But on the way to the thousandth we've had some adventures, and challenges. How about the days when the corrugations were really troublesome: we estimated six corrugation bumps per meter for an 80 km day. 80000 meters times 6 equals 240,000 hand-stunning back-shaking rear-end- numbing bumps. Then we thought, even if we halved that, it's still a lot of bumps. Of course, that was back then, two-weeks ago. How many corrugations since then? Too big of a number to grasp, but it gives some idea of the cycling. Number of hills? In the thousands. How about the number of Eucalyptus trees: I turn my head towards the campfire and I count several hundred around our camp. Horizon-to-horizon we've seen of Eucalypt forest and grasslands for a thousand kilometers. 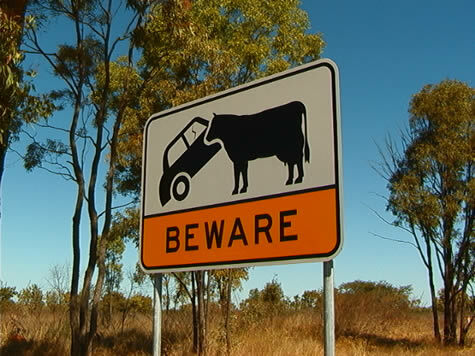 Wow…how many cattle in 500 kms of huge cattle stations? 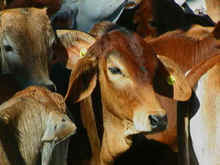 Riding through vast herds of Brahma cows and calves, with the bulls keeping a watchful eye on us. Numberless stars, uncountable. The Southern Cross in the midnight sky, in the southerly end of the Galaxy of stars arcing overhead, from horizon to horizon, giving the complete and total sensation of curved Earth and Heavens. 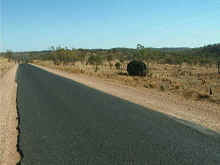 Back on the dreaded paved road, the bitumen: a minimum of one dead kangaroo, wallaby, bush pig, cow or hawk per kilometer. We rode 210 kms on the bitumen, and are glad to be rid of it. 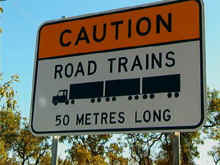 And the Road Trains, giant truck-trailers 50 meters in length. How many passed us by? Not many, but too many, and there will be more. Esmeralda Station, 1,000,000 square acres, where we are camped tonight deep in the bush. How big is a million acres? When you think of Australia, what words come to mind? A huge coastline with endless beaches? 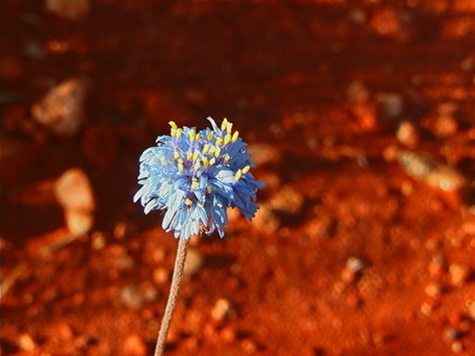 The red deserts of Central Australia, hot and vast? The Sydney opera house? Everyone in the bush looking like Crocodile Dundee? What will we remember from these first 1000 kms in Queensland? I will hear birds. A musical cacophony in perfect harmony of screeching, cawing, singing, hooting. Hawks flying alone in the late-morning rising heat, a thousand Galah parrots and Cockatoos flying in circles each morning and night, strange birds out in the bush at night crashing through the branches, and the Kookaburra sitting on our bike handlebars waiting to steal a bit of food. Birds are always with us, although we left the Kookaburra behind back in the thicker forests. Words and numbers…a way to describe and to remember by, and to communicate to others. The `1000th kilometer itself: big deal. As a means of marking time, distance and space here in the outback, a good time to take stock and see where we are, where we've come from, where we're going. After about 210km of whining, we finally made it to our next dirt road! We're quite tired of pavement. There's been very little benefit to it. Can't really say it even allowed us to cover a lot of ground. Yesterday, we were psychologically terrorized by a close call with a road train. As we licked our wounds just off the bitumen our tires were perforated with thorns. We were ready to call it quits early. It's not even pleasant to cover a lot of distance when we are able. We twitch madly with the manic energy of hummingbirds as we try to keep track of two-way traffic on a strip of roadway that barely allows one. Then with deep gulps we breath in the humid vapor of bloated roadkill while the sun pounds with a two-flanked attack-searing from above and simmering from below as the tar road slowly releases back the heat of the day. A new record for us, though. About 100km with plenty of time to rest in the shade of our truck and finally enjoy the time before dinner. Tomorrow will open with relatively familiar territory-a nice gravel road we will share with little more than the cattle. We hope. We want our dirt back! If we don't get our dirt back soon, one of us is going to die. We cycled for 80km today on the sealed road. Every so often a road train or a camper van full of retirees would pass. We had a fairly good system, and because the road was very straight and had hardly any corners, we usually had advance warning of their approach. The day began fairly well with a seven o'clock start. Cold, but nice. A few cars passed, and we had no troubles with them. We arrived at Georgetown at about eleven; this was where were to leave John, who was going to Brisbane for a painting show. We stayed in the small hole of a town for an hour, waiting for a battery to arrive, parted with John, and went on our way. Past the copious amounts of road kill (that was so yesterday, sorry guys), we pedalled on and on. Sun bearing down on us and giving us a generous North Queensland tan, or freckles for some. Three corner jacks became Bel's worst enemy. When we left Georgetown, (all breathing a sigh of relief to see the back of the town) Bel found she had a double puncture. So we stopped and fixed that. One kilometre down the track Bel found she had another puncture and so we stopped and fixed that also. Looking over my shoulder every thirty seconds would give me enough warning when a car or a road train was coming. With the exception of one time, when a road train had snuck up behind us, and passed with less than half a metre's clearance. It kept on coming, it was rather big, and from then on I can't quite remember what exactly happened - but I do know that the group had stopped rather hastily after the truck had passed. This caused me to stop in a sudden, and due to the stress of the moment and the swapped around, rotten American braking system, I jammed on the left-hand break. On my bike that would be the back brake, though on the American bikes the left is the front, not back, so I went over the handlebars and bit the dirt. Fortunately, I lay on the ground for a minute to work out what was hurting more, my right hand little finger, or my grazed elbow. Jim insisted I take some "crash medicine" and off I went. Just two kilometres onward and we reached camp. I am now sitting beside Bel and Todd writing updates. get in the way of the monstrous machines. We want our dirt back! 2001 August 8, Wednesday. Einsleigh River. The corrugations petered out beneath us, ending with the abrupt G-d-d-d-d-d of a cattle grid. Today’s first ten clicks marked the last of the station roads we can expect to traverse for nearly two hundred kilometres. We had left the dustbowl behind, and before us lay the Gulf Developmental Road. A sealed road - asphalt, blacktop, tarmac, bitumen, - complete with a painted white line down the centre. Incredible! After only fifteen days out from Starke River, it’s hard to believe that this intimidating reminder of civilisation is a normal road, and what we had all been used to in our ‘former lives’. The first thing we noticed was the putrescent odour of decaying flesh. A quick glance at our surrounds revealed a feral red fox, and an eastern grey kangaroo, both of which had been partially consumed by scavenging birds. This was to be just the tip of the iceberg of what we were to experience in the day ahead. 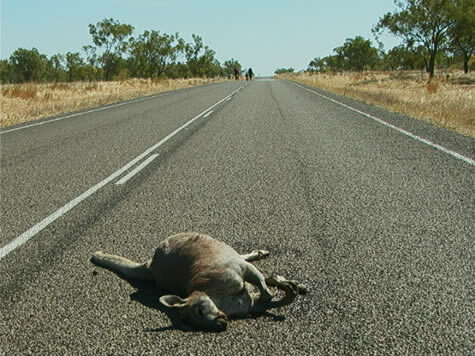 Each kilometre travelled would disclose, on average, two or three road-kill; including an assortment of possums, toads, wild dogs, grey kangaroos, and wallabies; all at various stages of dismemberment achieved by their hungry fellow wildlife. The next change noticed was the appearance of printed road signs, containing relevant, accurate, information on the road in front of us, and obviously commissioned by a road management council. We had grown accustomed to the provincial efforts of people like Bill the Gold miner - typically scrawled in black texta-pen on a rusty hubcap nailed to a tree, and never actually encompassing every possible option at a crossroads. Our only settlement of the day, Mount Surprise (approximate population 60) was a surprise only in that there was no mountain there at all, only a hillock visible in the distance. However, any disappointment the absence of the mountain may have evoked, was entirely transcended by the fact that we did not have to cycle up it. My first flat tyre during the trip so far was one of three tubes I destroyed today because of thorns. Our progress was hampered by cow heads, also known as goat heads, and three corner jacks. When replacing the first tyre, I counted more than a dozen of these thorns piercing it clean through. I must curb my tendency to ride off the side of the road while we are passing through this part of the country, as we all have developed a few habits which we will need to alter for the next few days. We reached the Einsleigh River travelling at more than double our usual speed. We had known we were going to miss the Jowalbinna - Maytown ‘Road’ as soon as it was put a safe distance behind us, and the vast plains, reminiscent of an African landscape, spread out before us. Although the day was a complete success - our camp here being as nice as we could wish for, and a change being as good as a holiday - we’ve rather had our noses-full of road kill already. I want our slow, laborious progress and incessant bull-dust back! 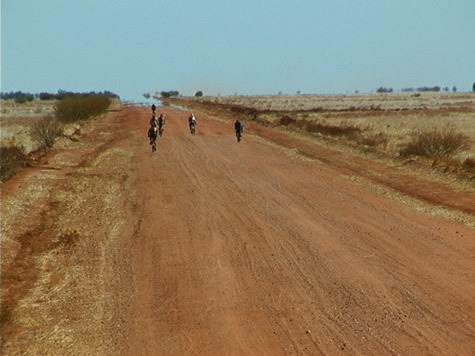 Roll on Tanami Track! True strength can be found in the grass that bends down to the ground with the strong winds and rises again when the storm is over. Mighty trees, taller and ‘stronger,’ break and fall to the ground in the hardest of winds, never to rise again. We rode 87 kms through open woodland forests, dry grasslands and vast open spaces. Leaving at 7:00 am was a great idea. The dew was still on the ground back at Pinnacle Springs Station when we packed-up our tents at the Kruckow family’s home. The air was cool and stayed comfortable for most of the morning. It was interesting that we’d left a family who’d shown us their strength through adversity: drought, illness, accident, hard work and love of the land have been their lives for a decade. In spite of the difficulties, or more likely because of them, their family and their connection with the land is all the stronger. The road became not as friendly after we turned to the south and followed a track for the 30 kms. Ruts, sand, sharp rocks which split Jason’s tire, and hand-wrenching corrugation as far as the eye could see. But, we kept pedaling, resting every 10 kms, checking the GPS, and moving on. No doubt we would have been far more tired two weeks ago. And here in camp we’ve recovered nicely, the Damper is on, dinner’s cooking, all three computers are out and we’re writing these updates. Over by the water hole the Black Cockatoo’s are shrieking and flying around by the hundreds. It’s a fine bush evening. The water hole, known here as an Earthen Tank, provides another perspective on adaptability and strength. Through human ingenuity, rain and stream water has been stored to allow the survival of a non-native species: cattle. Without the water storage, the cattle operation is impossible. And as a side note, it provides water for the Black Cockatoos, as well as the Kangaroos, whose population has increased with the availability of water. Thinking of strength here in the bush, the vegetation is a perfect example of strength through adaptation. The vegetation here has adapted to extremes of climate. It doesn’t rain for perhaps 7 months, and then there’s 5 months or so of hard rain, flooding large areas of grass and forestlands. The Eucalyptus varieties, especially the Box Eucalypt in this region, are well suited to climactic variations. They are strong, and out here only the strong survive. Black Cockatoo, which live to be over 100 years old, have certainly adapted to extreme changes in weather. They migrate to the coast just before the ‘wet’ arrives. Their strength lays in their ability to find water in the ‘dry’ and sense when the ‘wet’ is about to arrive, during which they couldn’t survive here in the bush. Strength is in adaptability. It can be said that strength isn’t a matter of what happens to you, but how you react to what happens. We’ve found strength in our own group, strength in the land, strength in the people we’ve met. "The first year we were here was the worst - terrible. The drought meant the cattle couldn't keep going. Of the 200 we started out with we lost about 100. Many of them we had to shoot to put them out of their misery. The rest just perished from thirst. We were digging sand out of creek beds where there was a spring. But we had to do it every morning because cattle were pushing in the sand in their desperation to get water. We started feeding molasses - that saved a lot. But it was shocking way to start a cattle station - a shocking start!" It's 08.30pm. 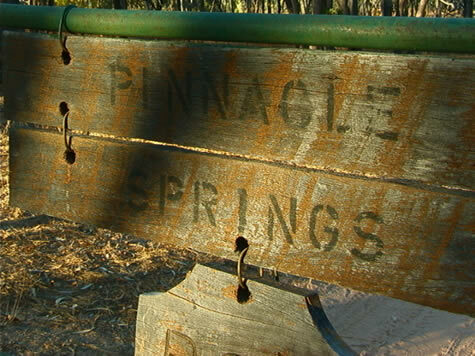 I'm sitting here in the backyard of Pinnacle Springs cattle station with 'Frog' - part owner of a 40,000-acre cattle station called Pinnacle Springs 30km south of the old railway town of Almaden. corrugations from Chillagoe to visit Emma and Laura, two pupils of the Cairns School of Distance Education. They met us at the front gate bare-foot proudly brandishing three newly weaned Kelpie puppies leaning enthusiastically over the lip of a tattered old polystyrene cooler being motored around in a wheelbarrow by one of the girls. Verna, Peter and Frog (mum, dad and Uncle respectively) were still out at the cattle yard administrating a 20 second baptism of castration and branding to some of 79 weener calves being run through the 'race' that afternoon. We joined them for the closing stages of the rather unfortunate (un)coming of age ceremony, sitting like spectators of a gladiator show on the wooden railings surrounding the pens, before retiring to the homestead for 'smoko' - hot tea and fruit cake. The story of these people is a classic tale etched from the stuff of early pioneers who scrapping a living from this hard, uncompromising country. They bought 64.5 square kilometers of 'marginal' land for $4 an acre back in 1991. This they reckoned would be enough to just about sustain a family at a ratio of around 40 acres to one animal. The first priority however was water and shelter. Peter and Frog quickly threw up a tin-shed that served as the family home until a new house was built a few years later. "The roof of the shed was still going on when I had Laura. I wasn't impressed! There was no phone, no electricity - washed everything by hand. Used to pump a bit of water into a tank each day until it would run out, so I'd have to wait until someone would come home and get me some more water. Had a baby. They liked it. They don't mind the dirt. of those unattached to the mercurial meandering of what fate can throw at you. One might even say these people are richer than city folks. Their ability to frequently laugh either at themselves or with those around them would certainly reinforce this theory in my mind. run cattle. So you don't really notice the hardships when you're doing what you want…" Peter Kruckow. The kids seem to respond well to their surrounding also. We spent the morning sitting in on their schooling, much of it facilitate by the HF radio through the School of Distance Education. Crister, Jim and Aprilalso helped Laura with maths while Emma participated in a Japanese class over HF radio. Because they can't see the teacher, Emma and Laura have learnt to become good listeners - better probably than most kids being taught in the regular school. And school doesn't end at 3pm in the afternoon either. Be it counting cattle during 'mustering' or learning how to treat for a snake bite, learning in such real-life surrounding continues not only throughout the rest of the day but seems to fuel the appetite for a future of lifelong learning. We had a good layover day at Chillagoe. Actually, it was a great day. The town looked pretty darned civilized as we rolled off the dirt corrugation from Elizabeth Creek up by Wrotham Park Station. We knocked-off 81 kms by 3:30 that day, and looked forward to a well-deserved rest day, our first since Maytown way back up there in the Palmer goldfields. Today we hit the road at about 7:45 on a fine, clear morning. We said goodbye to Josh's parents and sister Sophie who'd come up for the night from Cairns with re-supplies and treats! We also had a great overnight visit by Norlia and Sherryll, our logistical support team and Distance Education contacts here in the bush. It's through Sherryll, the Distance Education teacher, that we're able to be here on this beautiful evening at Pinnacle Springs Station, 19 miles down the railroad line from Almaden. We're all getting stronger, for sure. We arrived here after cycling 30 kms from Chillagoe to the Ootan turnoff. Tea and sandwiches (heaps of peanut butter! 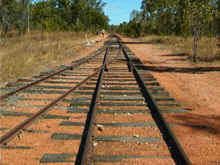 ), and we were on our way, following the track, which parallels the Cairns-Kuranda Railway. The railroad is the defining means of original communication and transport in this area. 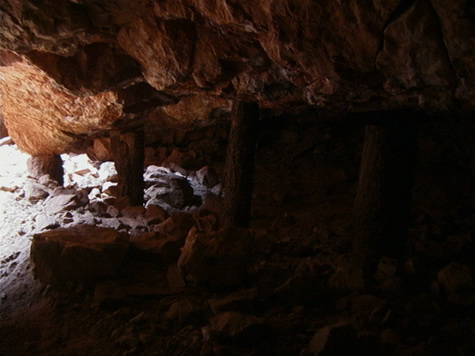 It was built for the mines in Chillagoe and Almaden, and the tin mines at Herberton. Begun in 1886 and completed in 1891, it opened Cairns as the main seaport. Read the History update today to find out more about the railway. For us, we arrived here at around 2:30 in the afternoon and walked over to the 'yards' to help-out with the branding of 60 'weaners,' cattle just removed from their mothers. "Hey man, where's my orange?!" Josh said while searching through the dark recesses of his camelbak. Jason and I snickered as we ate the succulent citrus treat behind Josh. We had taken the orange earlier in the day straight out of Josh's camelbak without him knowing it. 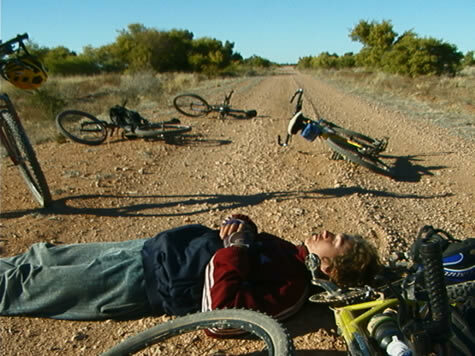 That was the general attitude of our ride from Wrotham Park to the small town of Chillagoe. During the 80 km day we messed around as we rode. Each moment and mile was passed playing incoherent, silly, and dumb games. Racing tactics, stealing food, tinkering with others bicycles were the name of the day! We've found that if you cycle with one driven goal in mind, i.e. your campsite, you won't get anywhere! Similar to when you are going on a long road trip and every second you ask, "when are we going to get there?" Why not enjoy the journey? Live in the moment! When we got to Chillagoe around three in the afternoon we were knackered! The weather had been good to us with the occasional cloud and sunny patch. 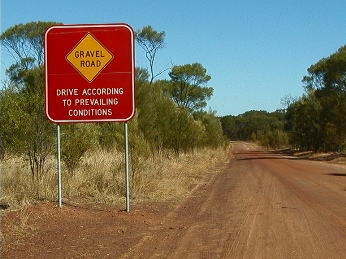 The corrugations over the whole day had beaten us up, but the bitumen (pavement) in town ailed our bumpy illness. Today we had a layover day here in Chillagoe. During our stay we have met a few people who have been following our expedition over the past two weeks. People we didn't even know! That was pretty neat! 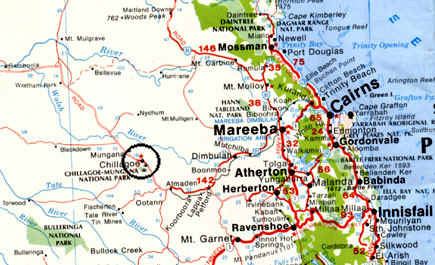 Looking over the map today in Chillagoe we've found that we have made a bit of progress, and have enjoyed doing it! We've found that to make miles, you need to get your mind off the task at hand and realize that "Darwin isn't going anywhere!" G'Day. My name is Sam. Sam Burke. I met the Expedition 360 team when they rolled up on their bikes to my home this afternoon at Wrotham Park station. It's the biggest cattle station in Queensland: 1.3 million acres. I was born in Mt. Isa in 1988, so of course I'm 13 years old now. From my house I see across the field to the airstrip, which we use for bringing in the mail, the Flying Doctor's, and the helicopter we use for mustering (herding) the cattle. Mustering is a bit like herding, but because of the huge distances involved and the number of cattle (32,000 head), using a helicopter to round them up is a lot easier than either horses, motorbikes - certainly than walking! In the morning I let the dogs out, have cereal for breakfast and 'go' to school. Go for me means about 100 meters down the path, past the garden and shed, to our other house. I'm schooled by HF radio through distance education. It's probably a lot different than what you think of schooling. Take a look soon at the section in Education on Information Technology to find out I play trombone in the schools band.